You have an MX80 with three ISP connections out to the internet. But…how do we achieve it on a Juniper MX80 Running Code that is applicable in the year 2012/2013? NOTE: If you have a filter applied to the interface it’s important that you put in the “then port-mirror” command on that filter. Notice: We are creating a fake IP address on ge-1/0/3 and giving it one particular address then we are creating an ARP entry with a completely different address in the same subset to map the TAP port for. 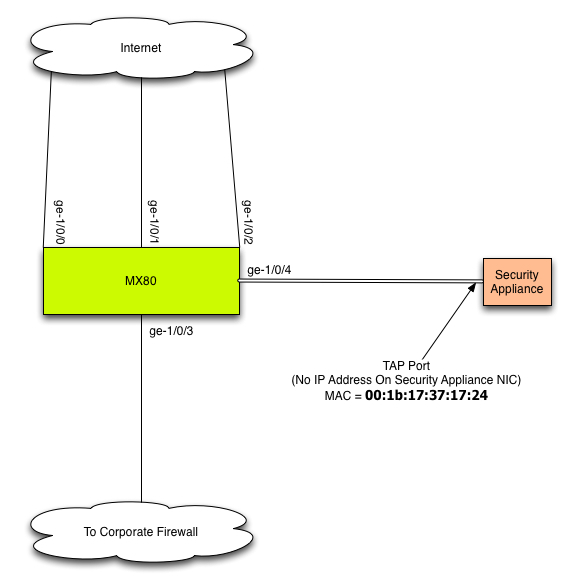 Having utilized routing-instances in the MX series to segregate management functions/protocols away from insecure internet sources I ran into an instance that’s quite unique to the SRX platform only. Normally for management items on an MX series one would create a separate routing instance away from the routing instance (see image below). This allows for segregation and reduces potential security holes in your design. Create a MGMT routing-instance and import/export ribs between the the main and mgmt inet.0 routing tables, NAT and re-route certain management protocols/functions (NTP, netconf, syslog, snmp, etc…) from the main routing table (inet.0) to mgmt.inet.0. Note: This assumes that your company is very strict on opening ports and doing NAT device cross talk between your outside region. Valid in corporations with standards…not so much within smaller companies that don’t care for security of course. While most items can be re-routed and transferred over, one particular item is not doable on the SRX systems themselves. If you want to use an internal ntp client to maintain and manage time for all of your server equipment SRX series routers simply cannot route ntp over any instance but the main one (IE. inet.0). So why doesn’t it work on the SRX Series? It’s the way the SRX bootup procedures are setup. It will always use the main routing table (inet.0). The little things and difference are usually annoying so hopefully somebody will find this article in case they have similar designs and requirements.